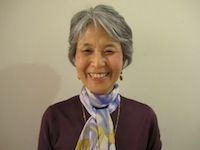 Yuri Ando experienced God's healing when she first attended an Opening to Grace retreat in 1987. She continued her healing journey and received training to become a Gestalt Pastoral Care minister, completing her internship in 2009. In 2010 she was accepted as a Gestalt Pastoral Care Associate. For two years, she taught the Foundational Training Class with Tilda Norberg at Arthur Kill Prison Facility on Staten Island. In addition to offering Opening to Grace Days and maintaining her private practice on Long Island, she also utilizes her training in Gestalt Pastoral Care as the pastor of a local United Methodist Church. Yuri is a graduate of Union Theological Seminary in New York City and has served as an ordained United Methodist minister at local churches in Staten Island, Westchester County and Suffolk County in New York, as well as a church in Connecticut. She offers a variety of retreats and workshops in healing and prayer.